Big Bend in South Australia is the longest single bend in the Murray River. The area is known for its spectacular riverside cliffs, which are the tallest along the Murray River. The limestone cliffs are rich with millions of ocean fossils and are home to colonies of bats. Caves in the area have been continuously occupied for at least 8,000 years and are sacred to the local aboriginal community. There is a collection of holiday shacks located on the banks. Big Bend cliffs are located near Nildottie and Swan Reach where you can visit by boat or take a road trip, only one and half hours from Adelaide or 40 minutes from Mannum. This image belongs to the travel and nature stock photo library. This stock photo of Sunset at Murray River Big Bend is available for licensing for commercial and editorial uses including websites, blogs, books, magazines, brochures and advertising. Restrictions may apply for images which contain third party copyrighted material or sensitive subjects. Photos of artwork are for editorial use only. 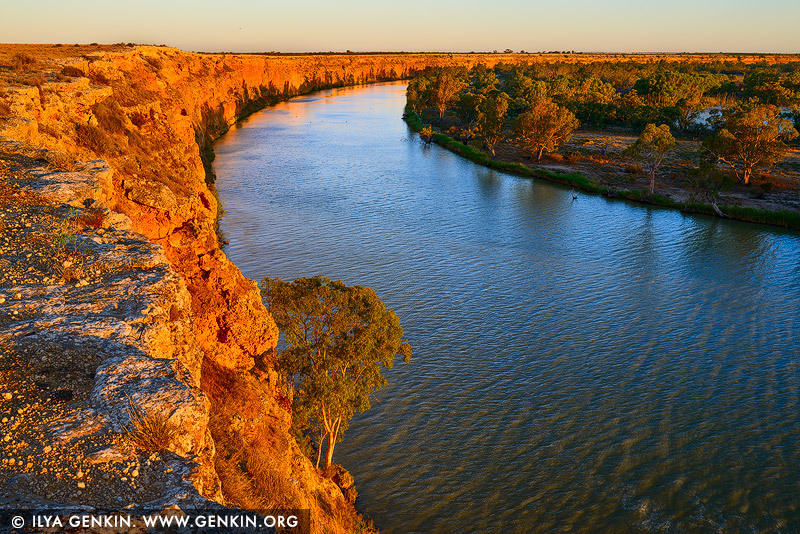 This image id AU-MURRAY-RIVER-0008 of Sunset at Murray River Big Bend, is copyrighted © by Ilya Genkin. This is not a public domain image.